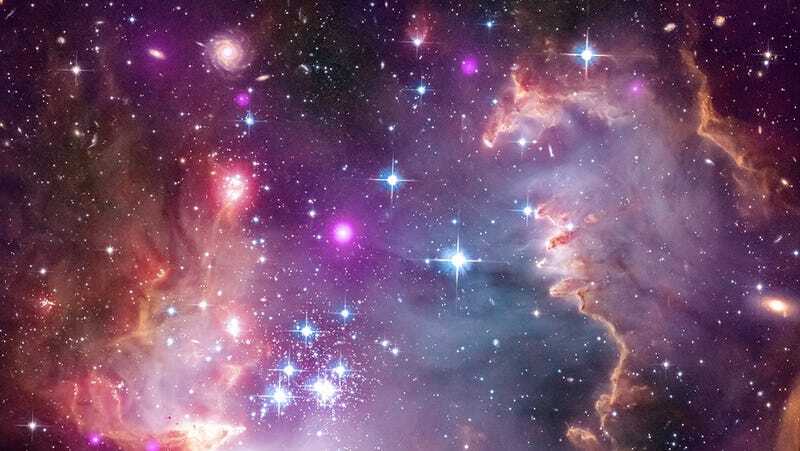 This totally stunning composite picture depicts the Small Magellanic Cloud, one of the Milky Way's closest galactic neighbors. Astronomers recently announced that they'd managed to detect X-rays coming from the young stars, of similar size to Earth, in the SMC's "Wing." X-ray emission traces the magnetic activity of young stars and is related to how efficiently their magnetic dynamo operates. Magnetic dynamos generate magnetic fields in stars through a process involving the star's speed of rotation, and convection, the rising and falling of hot gas in the star's interior. The image above is a composite, made up of X-ray data from Chandra in purple, visible light from the Hubble Space Telescope in red, green and blue, and infrared data from the Spitzer Space Telescope in red. This combined data also reveals something we've never seen before outside our own galaxy: objects at a younger stage of stellar evolution than stars, so-called "young stellar objects." You can see a version of this image with those objects labeled here.